Author(s): Simona Camorani, Laura Cerchia. Istituto per l’Endocrinologia e l’Oncologia Sperimentale “G. Salvatore”, CNR, Via S. Pansini 5, 80131 Naples, Italy. Malignant glioma is the most prevalent and lethal primary brain tumor. Due to molecular heterogeneity and organ-specific clinical manifestations, it is essential to improve glioma treatment by shifting from conventional cytotoxic chemotherapy to more targeted therapies. Hence, innovative approaches based on ligands able to specifically detect and measure mutated proteins associated to a specific tumor phenotype are needed in order to refine diagnosis and therapy of glioma. To date, antibody- based approaches have been developed for in vivo applications but, in most cases, they show toxicity, do not reach adequate sensitivity and have a low permeability across the blood-brain-barrier. Single-stranded nucleic acid aptamers, generated by the SELEX (Systematic Evolution of Ligands by EXponential enrichment) process, have been shown as a valuable alternative to protein antibodies because may couple the advantages of their chemical nature to the high specific binding of antibodies to their proper targets. The simplicity of aptamers selection and derivatization with other molecules (nanocarriers, tracers for imaging, drugs) combined to low immunogenicity and toxicity, render them a versatile tool for identification of new biomarkers, in vitro diagnosis, in vivo imaging and targeted therapy. Aim of this review article is to discuss contemporary applications of aptamers as innovative tools for glioma diagnosis and therapy. We will describe promising new approaches for the identification of aptamers targeting proteins with a crucial role in glioma, including SELEX protocols against living glioma cells and brain tumor-initiating cells. Additionally, we will review recently proposed aptamer-based strategies for site-targeted controlled delivery of therapeutics and imaging agents to the brain. Summarizing, we hope that this article will provide an updated overview of perspectives and challenges for aptamer-based glioma treatment in the near future. Keywords: Glioblastoma, in vivo imaging, nanomedicine, oligonucleotide aptamer, SELEX, targeted cancer therapy. Affiliation:Istituto per l’Endocrinologia e l’Oncologia Sperimentale “G. Salvatore”, CNR, Via S. Pansini 5, 80131 Naples, Italy. Keywords:Glioblastoma, in vivo imaging, nanomedicine, oligonucleotide aptamer, SELEX, targeted cancer therapy. Abstract:Malignant glioma is the most prevalent and lethal primary brain tumor. Due to molecular heterogeneity and organ-specific clinical manifestations, it is essential to improve glioma treatment by shifting from conventional cytotoxic chemotherapy to more targeted therapies. 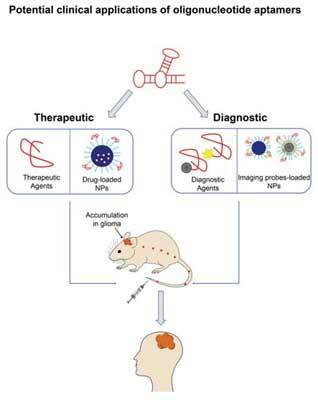 Hence, innovative approaches based on ligands able to specifically detect and measure mutated proteins associated to a specific tumor phenotype are needed in order to refine diagnosis and therapy of glioma. To date, antibody- based approaches have been developed for in vivo applications but, in most cases, they show toxicity, do not reach adequate sensitivity and have a low permeability across the blood-brain-barrier. Single-stranded nucleic acid aptamers, generated by the SELEX (Systematic Evolution of Ligands by EXponential enrichment) process, have been shown as a valuable alternative to protein antibodies because may couple the advantages of their chemical nature to the high specific binding of antibodies to their proper targets. The simplicity of aptamers selection and derivatization with other molecules (nanocarriers, tracers for imaging, drugs) combined to low immunogenicity and toxicity, render them a versatile tool for identification of new biomarkers, in vitro diagnosis, in vivo imaging and targeted therapy. Aim of this review article is to discuss contemporary applications of aptamers as innovative tools for glioma diagnosis and therapy. We will describe promising new approaches for the identification of aptamers targeting proteins with a crucial role in glioma, including SELEX protocols against living glioma cells and brain tumor-initiating cells. Additionally, we will review recently proposed aptamer-based strategies for site-targeted controlled delivery of therapeutics and imaging agents to the brain. Summarizing, we hope that this article will provide an updated overview of perspectives and challenges for aptamer-based glioma treatment in the near future.